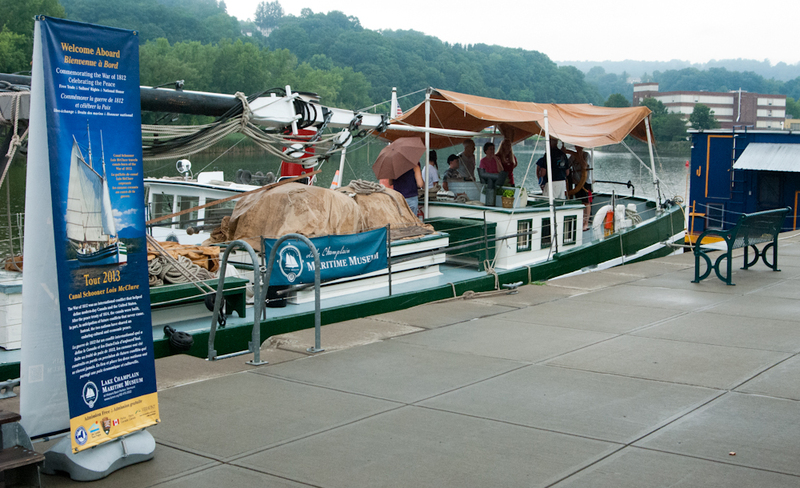 On July 11th, the tug C. L. Churchill towed the replica canal schooner Lois McClure down the Hudson River from Waterford to Troy. We were supposed to be heading west rather than south, out the Erie Canal toward Buffalo, but creeks, like the Schoharie, had turned into raging rivers and caused so much water to roar down the Mohawk that lock gates and dams had been wrenched and holed. The New York Canal Corporation’s construction crews were still repairing and rebuilding for all they were worth. Meanwhile, we would go to Troy and take the city’s waterfront back 150 years. There was plenty of current, too, in the Hudson. We were down to the Federal Lock before we knew it, and coming out of the lock, saw that the green buoy marking the shoal to starboard was being towed almost under. Luckily (that ever-present factor in this enterprise), all that current was right on our stern, so steering through it to the more quiet water beyond, was easy. And when we turned into the current to land on the floating dock at Troy, we could angle the schooner into the flow and, by changing the angle as needed, use it to slide the vessel sideways right in where we wanted her. Love it. 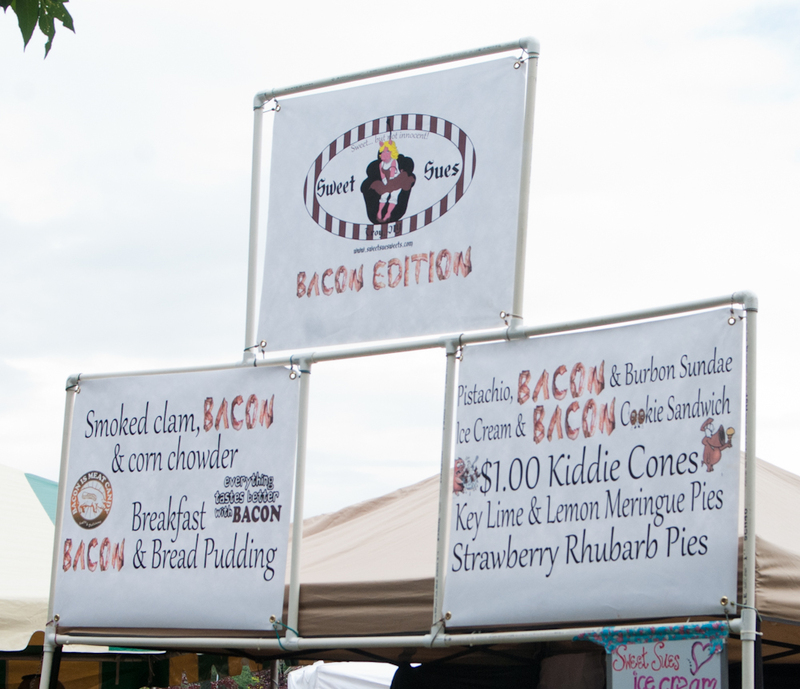 The Trojans were to have a Pig-Out during our visit, an event that was forecast to bring in 30,000 hungry souls. We were moored at some little distance from the succulent goings-on, and so could entice only about 400 of the gourmets on board for an extra course of history. But it was like dessert for them, and for us. We continually relearn the old adage that the teacher learns more than the student. In any event, the comfortable pace of visitors coming up the gangway led to many an interesting, unhurried conversation. After a day of show-and-tell with youth groups on July 16th, we headed back up the river to Waterford. 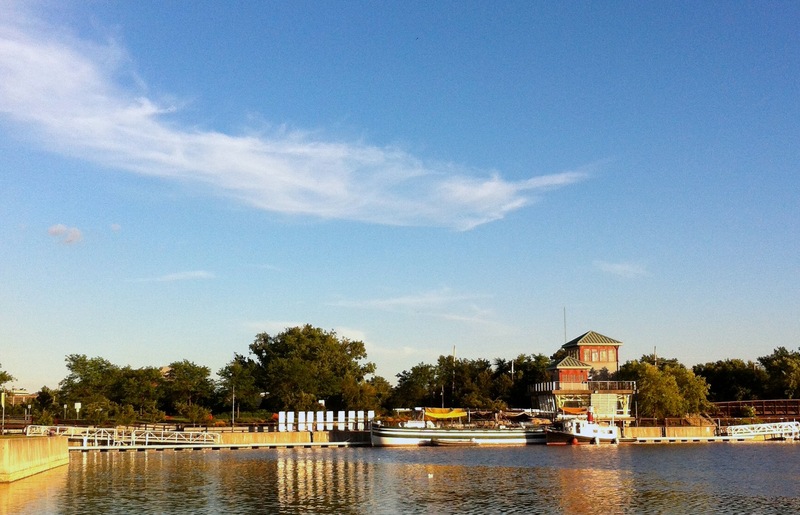 It was a nice, early-evening run; the current had eased and the Hudson was glassy calm. And the news from the New York Canal Corporation was good; repairs were being completed, and the canal would reopen in three or four days! So, next day, we ran back up to Lock 7 and, this time, with a lot less water coming down the Mohawk, moored above the lock, rather than below it. The weather had turned from rainy and cold to sunny and hot; at the schooner’s wheel, in the shade of the stern awning, a thermometer registered 99 degrees. The heat was somewhat relieved by a headwind on the 18th for the tow up to Amsterdam, and our speed of 5 knots added to it. Mercy. The crew had a lay day in Amsterdam and then converted the vessel from traveling (and living-on-board) mode to 1862-museum mode in order to receive on board Amsterdam’s eager, history students, young and old. On July 21st, we travelled to Fort Plain. Again, there was plenty of wind. The hardest part of maneuvering the schooner with the tug on the hip is when a strong breeze catches her high bow. A sudden gust from one side or the other will swing the vessel off course. You can see it coming from the dark patches of racing ripples on the water, but you can’t turn the vessel into it quickly enough to meet the swing. We did test the strength of our fenders on some of the lock walls between Amsterdam and Fort Plain. We can always count on a warm welcome at Fort Plain. We knew that this community had been especially hard-hit by the floods that had merely caused us a delay. We wanted to express our empathy in some way, perhaps bring some sort of gift. We decided that maybe it would be best simply to give to the citizens of Fort Plain more of something that they already had—our friendship. So we concocted an official Proclamation of Friendship, framed it, and read it aloud as we presented it to the town’s unofficial welcoming committee, our good friend, Sevim Moraski. And then nothing would do but her treating the whole crew to an elegant breakfast next morning. As we left, well fed, for Little Falls, we wished Sevim and all her neighbors smooth sailing in the days and weeks ahead. Proceeding west up through a few more of the Erie Canal’s thirty-four locks, we had a not- uncommon experience, a half-hour’s wait, in the approach to a lock. We often liken navigating on a canal to overcoming an obstacle course. And so, I got to play one of my favorite games with the schooner: seeing how long I can let her drift without a nudge from either the Churchill or the Oocher. On this occasion, we had a light breeze from astern giving us a little headway through the water against a slow head current. I believe I did set a new record of 27 minutes. In the evening, at Little Falls, we turned the McClure back into a museum and welcomed aboard a number of her fans. Well, I suppose that in a way they are the crew’s fans too, which is very satisfying. On July 23rd, we had a long run to Sylvan Beach, at the east end of Oneida Lake. According to my ship’s log, we got underway at 6:20 a.m. Sure enough, at our second of four locks to be negotiated that day, the old obstacle course manifested itself: the lock-keeper radioed that one of the downstream gates was out of order and wouldn’t open. Would we be able to squeeze through with only half the usual width? Well, yes, but not with the tug on the hip. So, we towed through the narrow opening very slowly with the tug ahead on a short hawser and the Oocher on the schooner’s stern for a brake. Whew. The Oocher needed only 25% power to stop her mother ship, and we didn’t even test a fender. Longtime readers of these logs may remember the warning given us by Cora Archambeault, who grew up on a canal boat: “Be careful crossing Oneida.” We heeded her warning on the 24th. The northwest breeze was fresh. It was calm enough in the harbor, but when I walked over to the beach early in the morning to take a look at the lake, I saw plenty of white horses prancing towards me. It would be a rough-and-tumble tow out there. We had been smart enough to build an extra day into our revised schedule for crossing the lake, so now, I reasoned, we should be smart enough to use it. It worked. 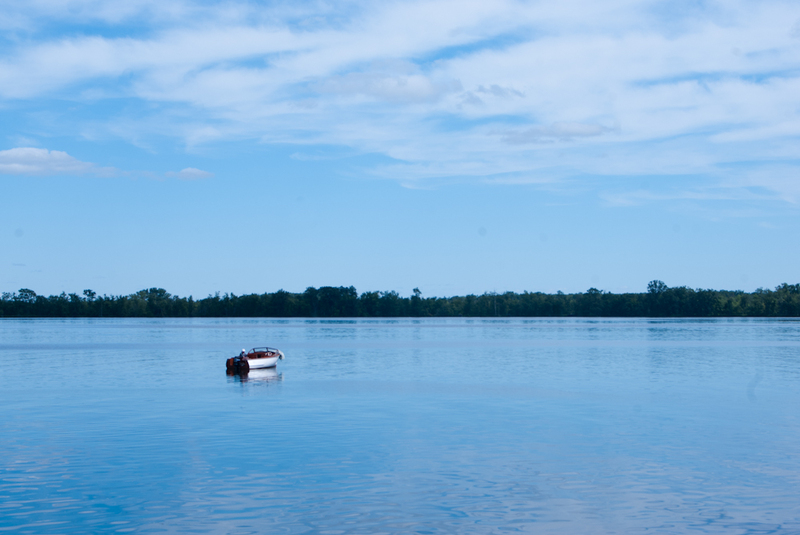 When we towed across to Brewerton on the long hawser next day, the lake was calm as a clock. We made the run from Brewerton to Syracuse on July 26th. On the way, we stopped at the Winter Harbor marina to fill water tanks and empty sanitaries. Art Cohn had brought the C. L. Churchill up to the marina the previous afternoon to top off his fuel tank. Thank goodness for marinas. I remembered the entrance to the Inner Harbor at Syracuse as being challenging. There’s a narrow railroad bridge opening made narrower by shoaling. When we tried it in 2007, a fresh breeze on the beam had twisted the schooner round just as we made our approach and I had bounced the luckily (!) well-fendered bow off the bridge abutment pretty hard. (No wait, that wasn’t luck; it was volunteer Steve Hayes’s skillful fast work with a fender.) This time, the only challenge was finding our way through a confusing-looking mass of buoys set out by the dredgers who are working on cleaning up the lake. Kerry Batdorf and Carolyn Kennedy scouted ahead in the Oocher, and their radio reports made the passage easy. It was at Syracuse where our longtime boatswain, Len Ruth, went ashore to take a temporary land assignment back at the Museum. We missed him immediately. His knowledgable, whimsical, sometimes sardonic comments from his station on the bow during maneuvers are not only informative, but also hilarious. Someday, we must persuade him to wear a microphone for the sake of posterity. When we left the Syracuse Inner Harbor on July 29th, the obstacle course was in full operation. Just past the bottleneck of the railroad bridge, there appeared to be a string of small floats right across the narrow channel! We brought the schooner to a stop with no deep-enough water to spare around her and sent the Oocher out to tow a long string of little buoys out of the way. Apparently they had been blown adrift from their usual position, perhaps marking a dredged area. Thanks goodness for the Oocher and her competent crew. After a passage with no further obstructions, we moored for the night on the upper approach wall to Lock 26 at Clyde. On the 30th, we had a lovely, quiet day out on the water for our trip from Clyde to Pittsford. It was punctuated by a pleasant meeting with the New York Canal Corporation tug Urger, under the command of our good friend Wendy Marble, who joined us later for supper on board, gave us all the latest canal news, and kindly, with her son, Noah, who has been one of our crew volunteers, drove us to available showers. The crew of the Lois McClure bathes ashore, and we owe many people many thanks for their help in keeping us presentable. It does sound good, but then starts a game of “Chicken,” not for the experienced bridge tender, who knows exactly when to stop the cars and trucks, but for us, for whom it always seems impossible that mere land traffic is still using the bridge even as we seem to be closing it at what now seems to be terrific speed. Rarely do I have the nerve to just keep her comin’. Anyway, thanks to the skill and attentiveness of the canal’s bridge tenders, what looks like an obstacle course on the chart, turns out to be an unobstructed passage. 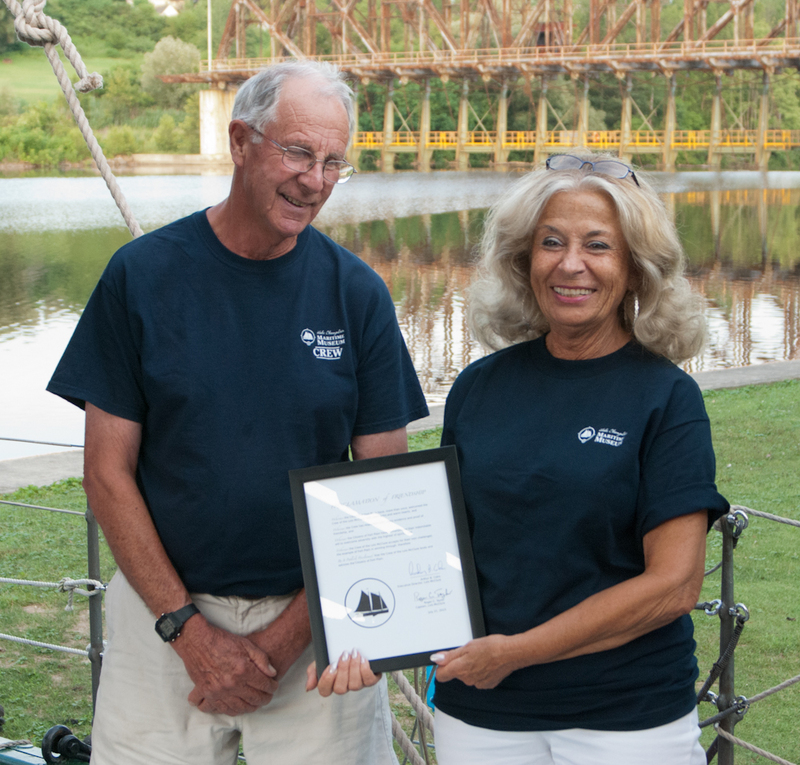 The run from Albion to Lockport on August 1st was short enough that we arrived to tie up at Canalway park by 2 p.m. We were to open our floating museum at 5 p.m. This would be the McClure’s third visit to Lockport, and, though it would be short, we knew it would be fully engaging. For the citizens of Lockport, a visit of the Lois McClure is important. Sure enough, an enthusiastic crowd, led by the mayor and supported by plenty of lively music including that of a bagpiper, was anxious to come on board as soon as we unfurled the “Open” flag. There was even a table of party food and drink. We love calling at Lockport. 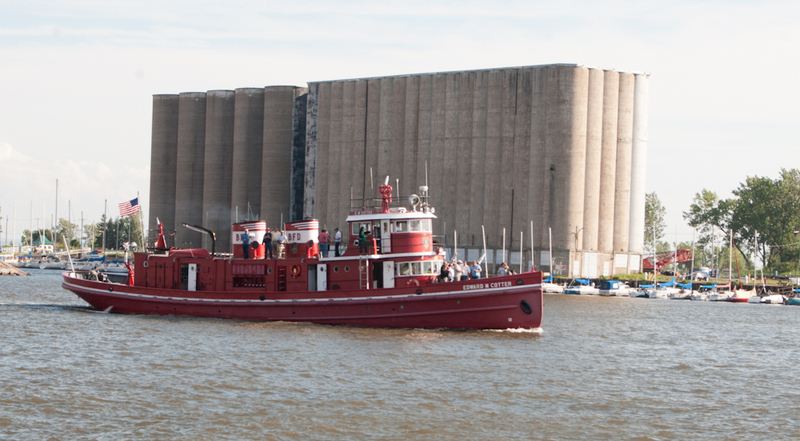 The New York Canal Corporation tug Pittsford, was awaiting us at Lockport, and the next morning, before getting underway for Buffalo, we met with her skipper, Harry Marquart. The Pittsford had been assigned to give us a tow up the Niagara River, where the current is always strong. So, we talked with Harry about where, when, and how we would be hooking up with his vessel. Which turned out to be just after passing through Tonawanda, or rather between the Tonawandas, for there is a North Tonawanda; at about 1 p.m.; and with two relatively short towlines that his crew would pass over from his stern to our bow. The Churchill remained towing on the hip as the Pittsford took a strain on the schooner’s bow. We had put a long headrope on the Churchill, because, to some extent, the schooner would be towing her. As Harry went up almost to “full boat,” as a tug master describes the position of his throttle, and our speed through the water approached 9 knots, the Churchill also went up almost to full boat, to ease the strain on her headrope and help with the tow. With this welcome combination, we went right up the river at about 5 knots over the bottom, so the current against us was about 4 knots. It’s always good to have a significant margin over the Niagara River current, what with the Falls astern. 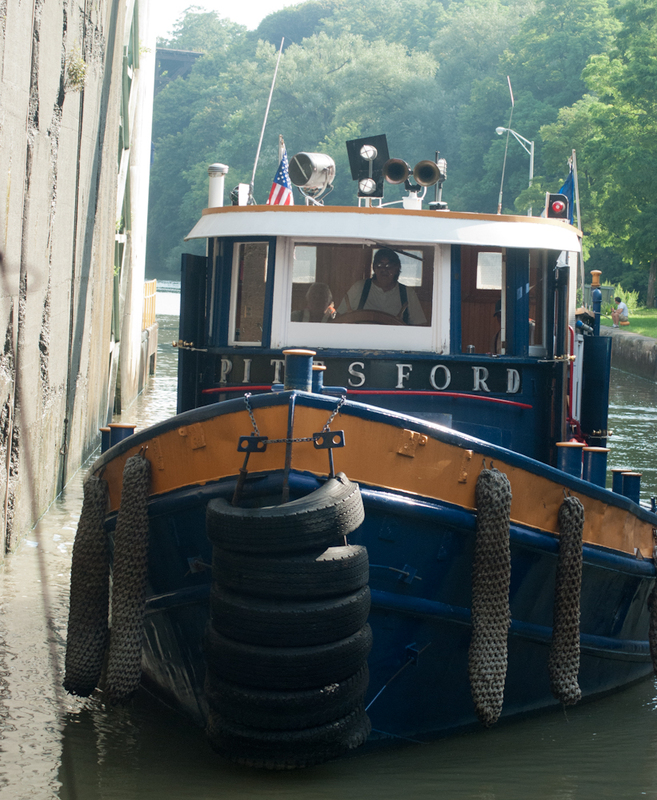 When we reached the shelter (from the current) of the approach wall to Black Rock lock, we dropped the tow from the Pittsford, and the two vessels proceeded in company through the lock and on up the channel to Buffalo harbor. The wind was in the west, blowing the length of Lake Erie down onto Buffalo at the lake’s east end. As we approached the harbor, it breezed right up to strong, about 20 knots with higher gusts. The breakwaters—they call them “breakwalls” out here—that form the harbor, giving protection from the open lake, naturally have a good-sized entrance gap, because a few big, Great Lakes freighters still bring grain into Buffalo. Waves were building out on the lake, and some of them made their way through the main entrance gap to make a significant surge, which was right on our beam as we approached the entrance to the Buffalo River. The schooner started to roll and the tug started to roll, pitch, and scend up and down in the commotion. Just what we don’t like with the tug on the hip. 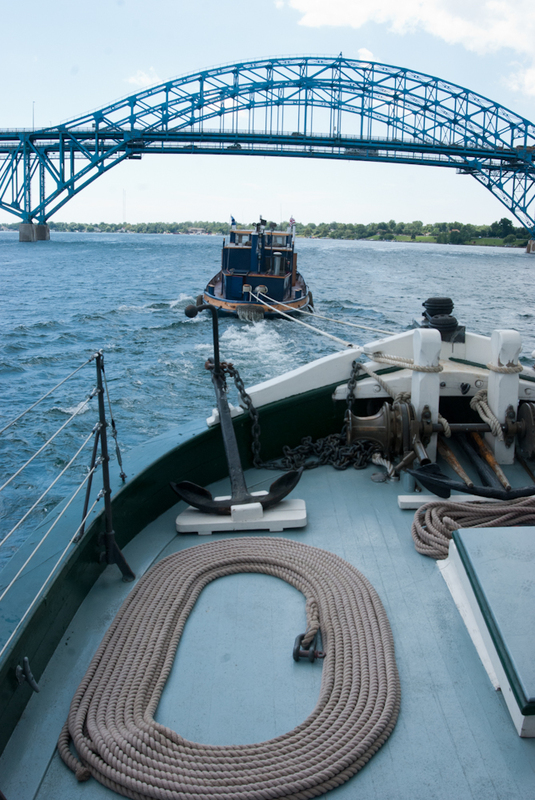 Luckily (there’s that again), the tug was on the lee side of the schooner, which helped. Even so, before we could turn into the quiet water of the river, our biggest fender, the one we call The Egg (from a dinosaur? ), simply exploded from the impact the two vessels gave it. Harry, following astern in the Pittsford, said that at one point, his steering stool simply went right out from under him. We were both glad to tie up on the new (to us), long, floating dock at Canalside Park in Buffalo. When we visited Buffalo in the McClure in 2007, this waterfront was moribund. On August 2nd, 2013, it seemed like the place to be, where everything was happening. The rejuvenation of the Buffalo waterfront is delightful. There is as much life here now as there was 150 years ago, when instead of one canal boat arriving, there would have been scores, along with an equal number of Great Lakes vessels. True, the activity now is recreational rather than commercial. On a day off, Kathleen and I were able to sample both a launch trip far up the Buffalo River and Ship Canal with excellent narration of the history of the port and grand views of the many huge grain elevators still standing, a few of them still in use, as well as a fine sail six miles down the harbor behind the long breakwall and back in the topsail schooner Spirit of Buffalo. 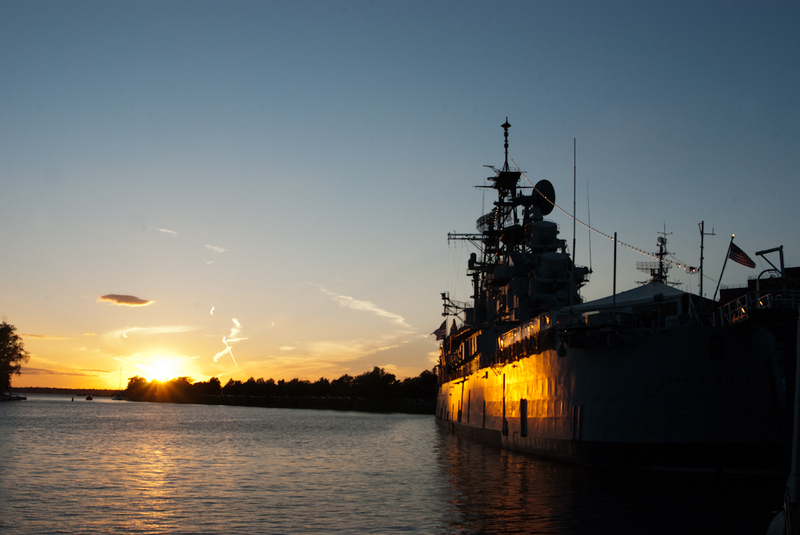 And since Buffalo boasts the country’s most extensive collection of U. S. naval vessels, I even got to wax nostalgic about my navy days by going on board near sisterships of the destroyer and submarine in which I served. 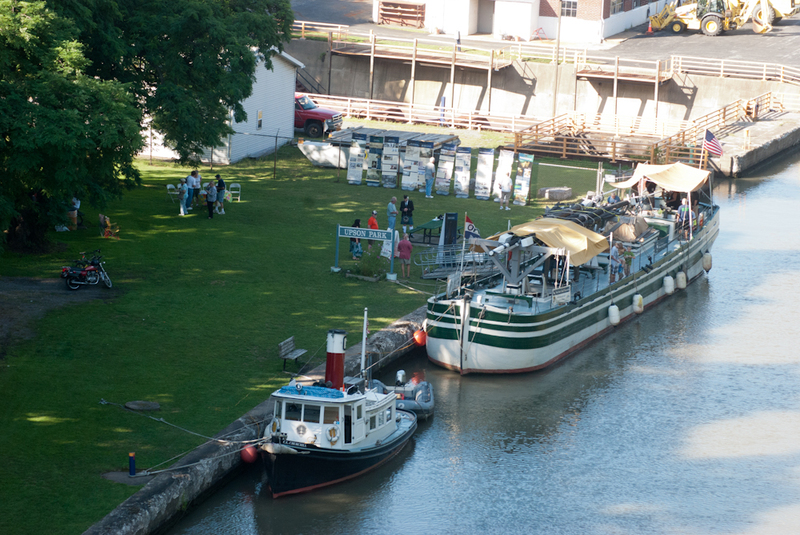 In such a setting, we expected to host a good many visitors on board our floating museum. 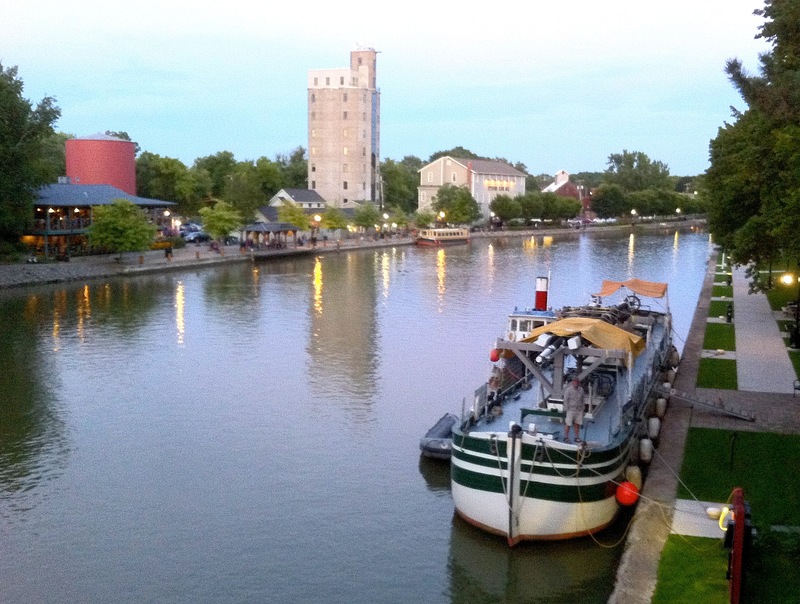 We were not disappointed: during our visit, we showed more than 2,000 people through this replica canal schooner, and helped the city of Buffalo explain to her citizens something of their history, for it was the Erie Canal and boats similar to the Lois McClure that made this town.